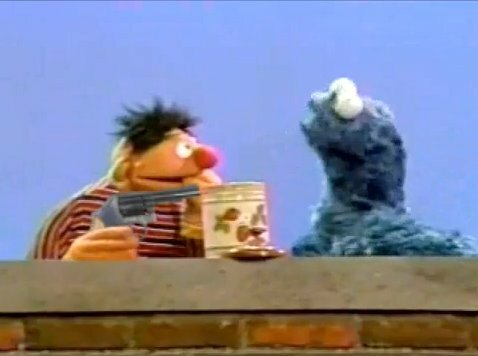 Yesterday I linked to the Sesame Street parody on Jimmy Kimmel Live in which Ernie and Cookie Monster explained Bernie Madoff’s Ponzi Scheme. It was done by dubbing over the original video. 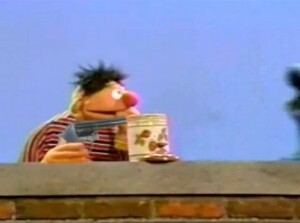 But of course, the original video does not show Ernie firing a gun at Cookie Monster. So how was that added into the video? Here’s how. Note that I wasn’t the person that originally edited the video, so I don’t know exactly how that person did it; but here’s how I would do it. First I need to export a frame in which Ernie’s right hand is clearly visible (and looks like it can hold a gun). And then I’ll take this picture and crop out just the hand. And then I’ll add a gun to the hand. And then, I’ll need to find a frame where the right hand isn’t very visible like this first picture, so I can put in this new right hand to cover up the original. And then after that, I’ll put the new hand into position. I’ll then move it upwards from behind the wall to reveal the gun. Now, since the hand will be in the layer above the original video while the hand really should be behind the wall instead of in front, we’ll need a portion of the hand invisible when it’s below a certain horizontal line. This is to make the new hand appear as if it’s behind the wall. A garbage matte effect would be a convenient way to mark which part is visible. That’s about it. And then after the gun fires, the original editor moved it horizontally backward and then forward again to show the recoil of the gun. I thought that was a nice touch. When a puppet character is shot, he/she usually falls down. However, Cookie Monster’s reaction to the gun shot was flying off the screen. This is easier to edit and it’s also funny and cartoonish. First we’ll need to create a background for when Cookie Monster flies of the screen. 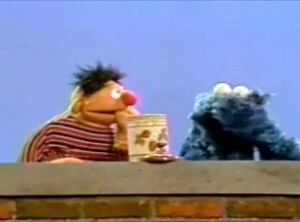 In the original footage, Cookie Monster is blocking the right side of the background. However, when he flies off, we’ll need to show that portion of the background. This is actually very easy for this video, because what’s behind the characters is nothing but solid blue. We just need to create a blue rectangle that matches the original background to cover up where Cookie Monster used to be. Here are two pictures for you to compare. The picture on the left is from the Madoff spoof, where the right side of the screen is already covered up with solid blue; the picture on the right is from the original footage, where Cookie Monster is occupying the right side of the screen. 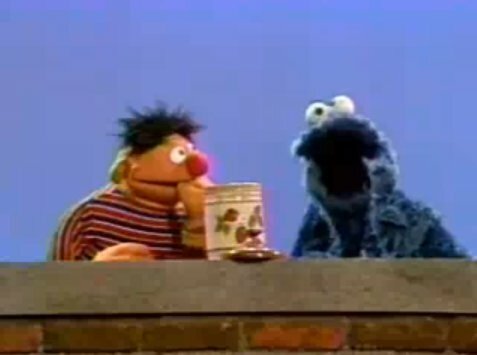 After we have the background, we can animate Cookie Monster flying out. 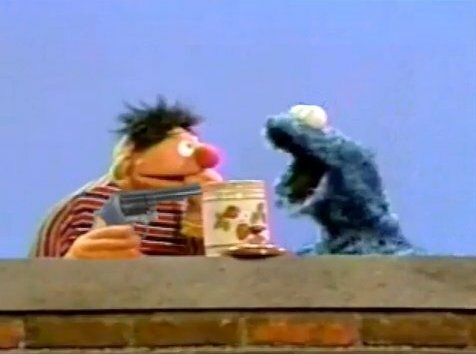 We just need the cropping effect to crop out Cookie Monster. And then we can shift it horizontally. He will start out where he was, zap across the screen and eventually be outside of the frame. So that’s how the editing is done. I find this kind of stuff fun. In fact, my first ever practice project that I assigned myself when I was learning to edit videos was similar to this. I decided to use some existing puppet footages (because I didn’t have a camera back then) and dubbed them over. I also used some blue screen effect to put things in the sky. I had fun doing that project too.